good shape but to ensure that its food-enhancing characteristics are maintained to the BBD. The EVA olive oil sensory standard is based on the most used international standards but is a bit stricter with regard to the intensity of flavor required at the olive oil BBD. High quality olive oil maintains its quality because of its natural protectants against degradation — the same reason it is really good for human health. Olive oil quality doesn’t last forever. Most good oils have a time period to the BBD of between 18 months to 3 years. This can be accurately calculated based on testing when the oil is made. This is especially important for consumers and producers. 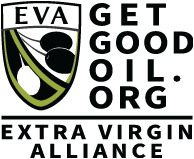 EVA wants consumers to be confident that the great olive oil they purchased will still be edible and good until, and possibly after, the BBD, and for its member producers to be able to plan their olive oil product sales with the confidence of chemical and sensory accuracy.